What I read: The Night Circus, by Erin Morgenstern. Five stars! I loved it. I started it Saturday morning and finished it up last night. What I cooked: This Summer Zucchini Skillet with Poached Eggs. We had it for dinner, it would have been equally awesome for brunch. And I poached my eggs the “real” way, without my trusty poach pods. 75% of them turned out picture-perfect. The other one? Not so much. The yolk kind of got squirrelly and tried to ditch the whites. What I canned: Basil Pesto, using basil from my yard. I hesitate to call it a “garden,” since it’s two basil plants and two parsley plants, but I haven’t had to buy either at the grocery store in months. That’s a win, folks. What I laundered: Everything! We picked the kids up from camp on Friday. They were exhausted but had a GREAT time. When the camp director mentioned that they had open slots for the last few weeks of this summer, Hollyn asked if she could go back. She wasn’t kidding. Even my risk-averse Tyler tried new things at camp, including tubing behind a boat and climbing the rock wall. Things have not been easy with Hollyn recently – partly because she’s almost 13, and partly because of incidents like this one. But two things happened over the weekend that make me think things are getting better. 1. Jason’s ex-wife has a brother who is married with two children. The girls spotted the family at the grocery store on Saturday, and asked if they could go say hello, which of course was fine. I watched them cross the great divide of the produce section and begin chatting, and I wondered what would happen if I walked over and said hello myself, so I did. And guess what? It was totally fine. The girls’ aunt was perfectly polite. I have no idea what she thinks of me, but even if she loathes me, she hid it for the sake of getting along in front of the children. THIS IS A REVELATION, and something that Jason’s ex cannot or will not do. The aunt introduced her daughter to Tyler, and they high-fived. THEY HIGH-FIVED RIGHT THERE IN THE MIDDLE OF THE PRODUCE SECTION, IN FRONT OF GOD AND EVERYBODY. I was completely floored and delighted. 2. 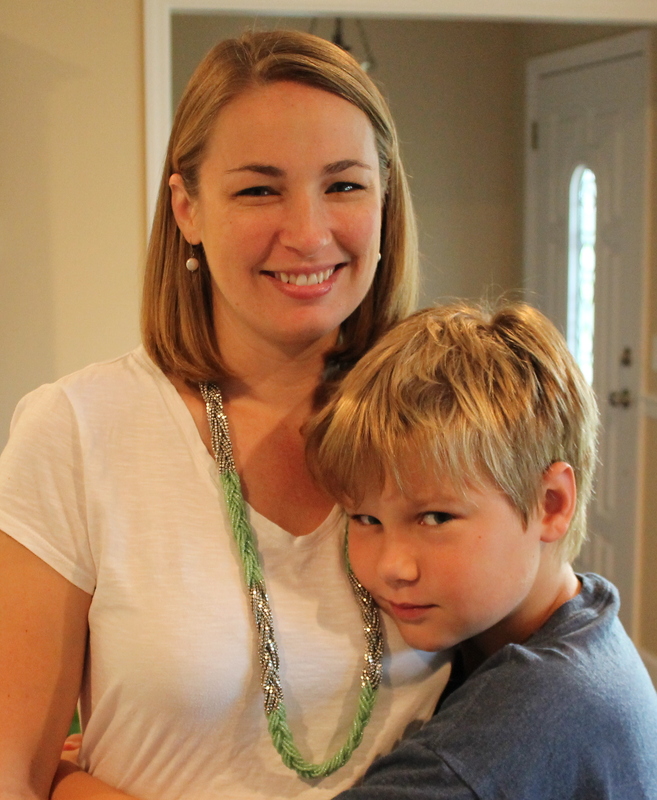 On Sunday we dropped all three children off at summer camp for the week. They’ll have a whole week to be free from all their parents – phone calls are not allowed, and they have no access to e-mail. They get to be completely themselves. Tyler went to this camp last year and had a ball. His excitement at returning was infectious – I expected the girls to be nervous, but they were just as giddy as he was. Not a single tear was shed – by us or by them! 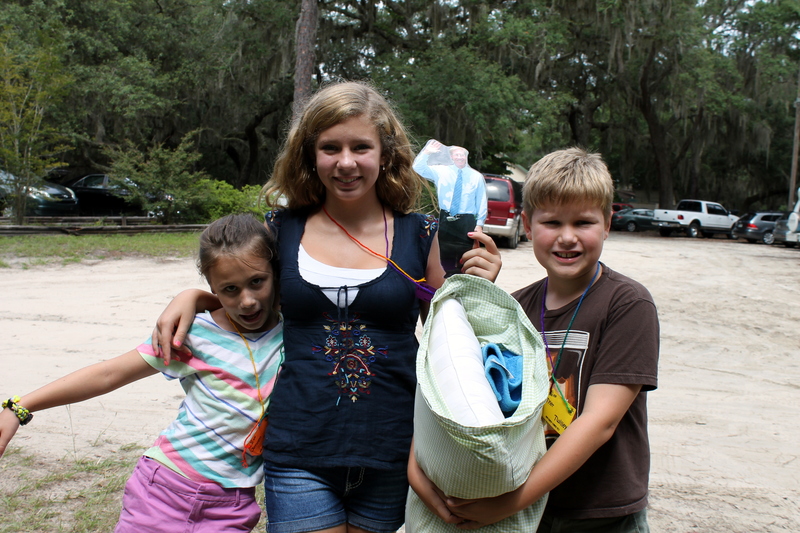 – when we took them to their cabins. We dropped Hollyn off last, as her cabin was away from the main camp. After making up her bed and showing her the bathrooms and common areas, we said it was time to go. She hugged both of us fiercely. “Love you guys!” she said. She’s never said that, or anything like that, in reference to me. That is, until yesterday. When Life Hands You….. Cucumbers? Buoyed by my tasty success with Blueberry Basil Jam, I hit up the farmer’s market last weekend for ingredients to make Food In Jars’ Garlic Dill Pickles. The cast of characters included clean canning jars, whole garlic cloves, dill seed (not weed! ), crushed red pepper, peppercorns, cucumbers, pickling salt, and apple cider vinegar. Y’all, I didn’t even know dill seed was a real thing. I thought for sure it was a typo in the recipe – especially after I searched high and low at Publix and Fresh Market with zero success. You know where I found dill seed? Wal-mart. I KNOW. As it turns out, pickles are way easier than jam. You distribute your spices and slices between jars, then fill with a hot brine (water + vinegar + canning salt) and process the jars in boiling water for 10 minutes. 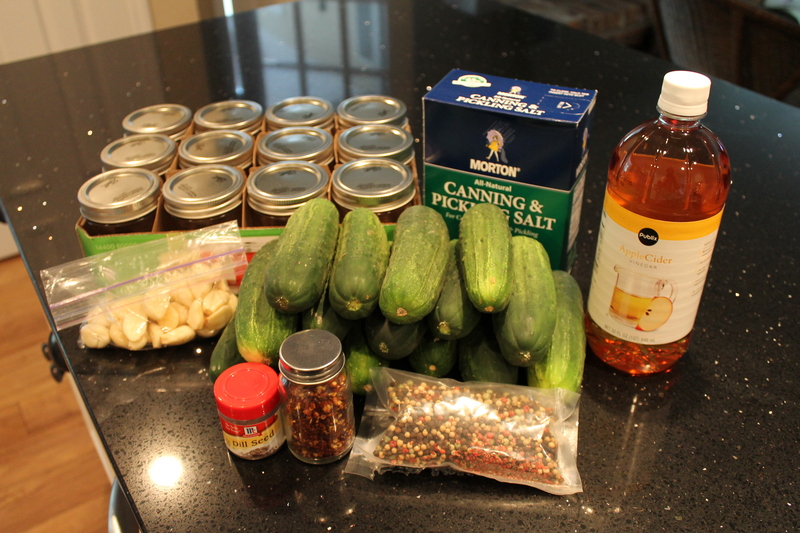 I only had enough dill seed for 9 jars, which left me with 6 leftover cucumbers. 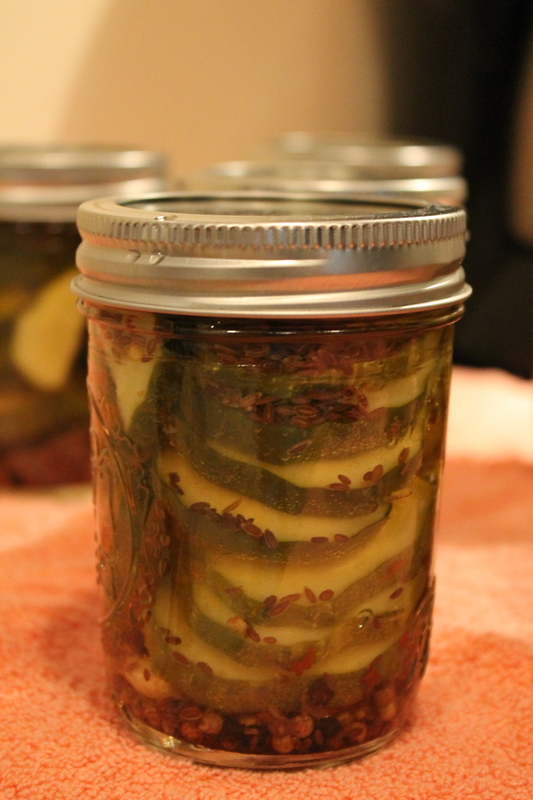 I made a second batch (8 jars) on Monday night after procuring more dill seed. 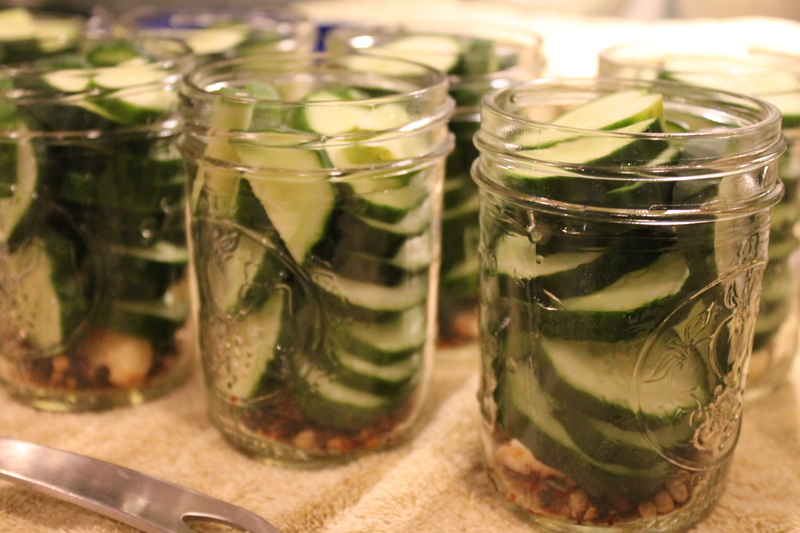 I sliced the cucumbers on the mandoline and used just a pinch of red pepper flakes per jar, and they were perfect. 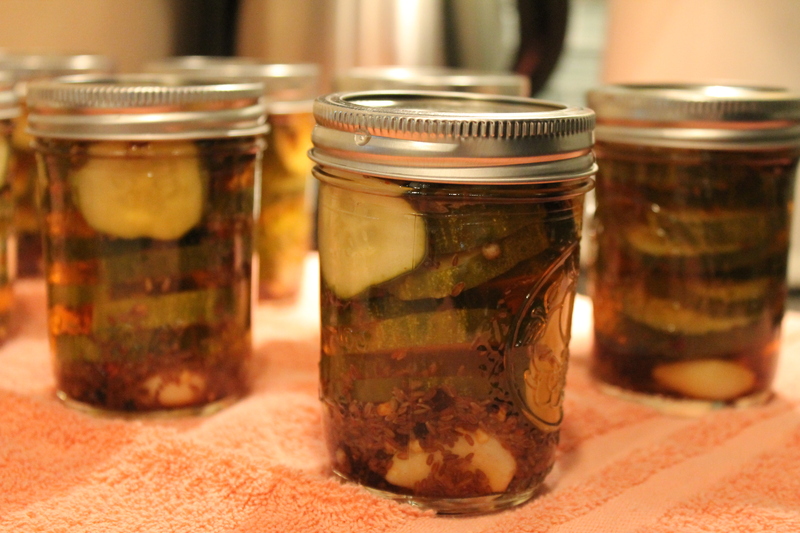 After processing, the pickles need to sit for 24 hours so that they can, well, pickle. It was a long 24 hours. Tyler gives these pickles two thumbs up. He’s already consumed most of a jar, all by himself. Thank goodness we have 16 jars left…. WIWW: Thou shalt not covet thy neighbor’s maxi skirt. It’s official. I’m in love. I love the look of maxi skirts…. on other people. Specifically, people who are not shaped like me. As a dear friend once observed (about someone else! I promise! ), ankle length skirts make me look rather like a door from the waist down. And so I resigned myself to letting the maxi skirt trend pass me by, like so many non-pear-friendly trends before it – skinny jeans, drop-waist dresses, and anything ever worn by Kate Moss. While I was on my summer top adventure/nightmare last weekend, I spotted this skirt lurking at the back of the Loft store. Because I am a glutton for punishment, and still licking my wounds from the Inadvertent Romper Incident, I tried it on. Angels sang. I kid you not. It was comfortable, it was reasonably flattering, it was….. the only item in the store not on sale. I bought it anyway. If you have been around me for more than about 30 seconds, you know this is HIGHLY UNUSUAL. I wore it to church on Sunday with a chunky turquoise necklace, and then again to work on Monday with an infinity scarf I made. It feels like pajama pants, and the wide waistband keeps everything where it’s supposed to be. I may wear it to sleep tonight. The plan was simple. I was almost out of my special-snowflake makeup, but was uninterested in paying Sephora to ship it to me. This meant a trip to the mall, which DO NOT WANT. I do not like crowds, I do not like strong smells, and I do not like tube-rompers. Right off the bat, my mission encountered setbacks. It turns out my local Sephora no longer carries my special-snowflake makeup. FAIL. Dejected, I turned to the only place that could possibly make me feel worse: Forever 21. Since I’ve been participating in What I Wore Wednesday at the Pleated Poppy, I have been impressed with several things from F21. Cute seasonal tops, for example. I took a deep breath and plunged in. My first thought was ABORT ABORT ABORT. The store is noisy, crowded, and utterly disorganized. It’s basically everything I hate about the mall in one place. But I was not about to let another setback derail my mission. I had made it this far, right? Into the heart of darkness? I rolled up my sleeves and got elbow-deep in the racks of cheap clothes. Just when I was about to flip my sh*t at the sheer (literally) horror of it all, I spied a cute top. 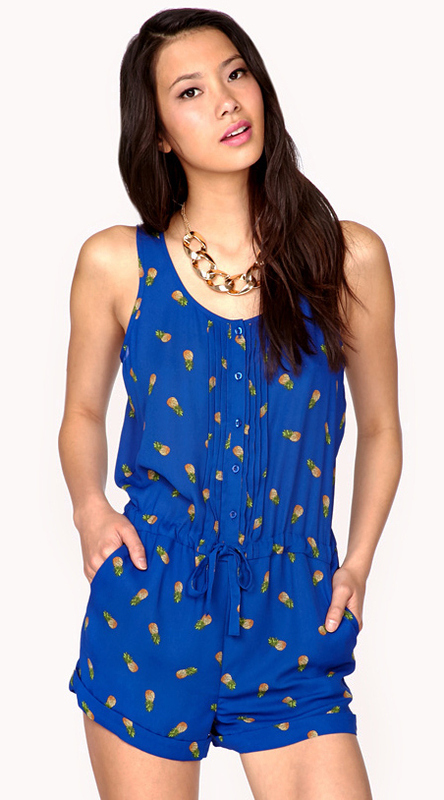 It was royal blue with tiny pineapples all over it, and featured a pintucked front and gathered waist. I had to check the tag to make sure it hadn’t been kidnapped from another store. I made my way to the fitting room and was just swinging it over my head when I encountered something….unexpected. My adorable top was actually a ROMPER. I yelped. Out loud. I’m sure the girl in the next dressing room thought I’d encountered a cockroach. I flung the offending garment away from me, betrayal flooding my heart. A romper. What the actual what. It was at this point that I decided my sanity was no longer worth saving a few bucks, and headed to Loft. 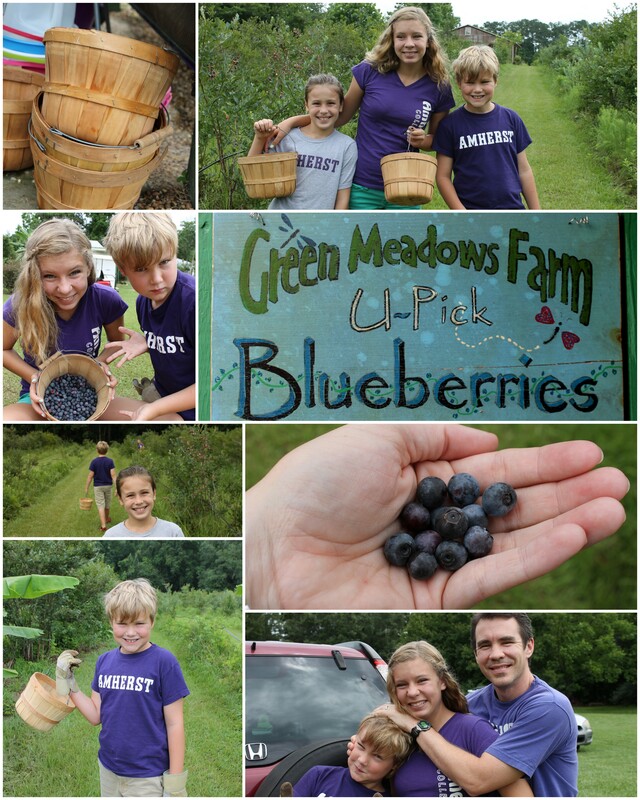 Last Saturday we thumbed our collective nose at the weather and headed to Green Meadows Farm in Monticello to pick some blueberries with the kids. 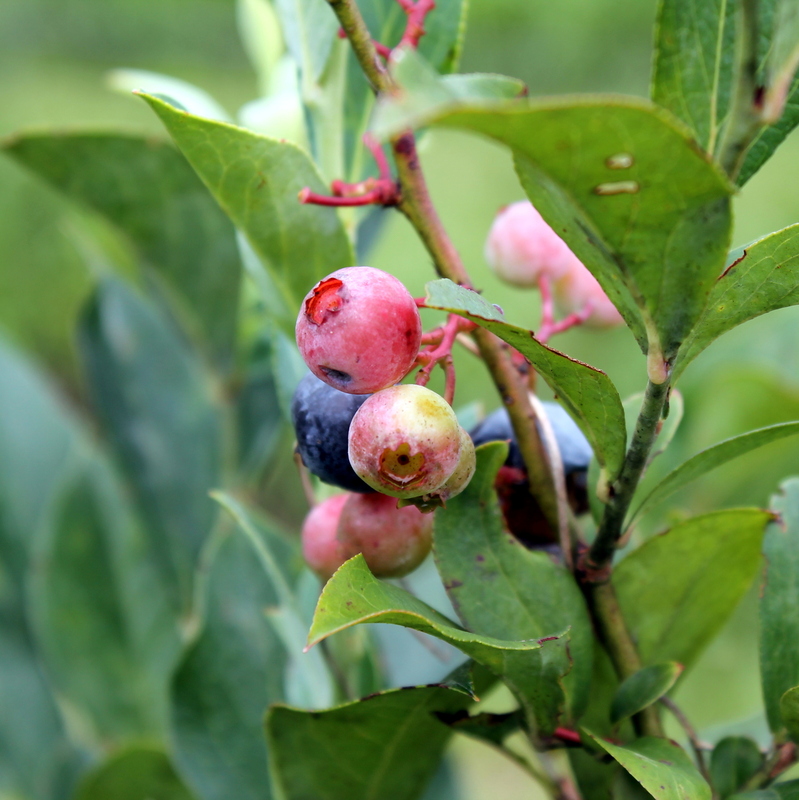 Since I am terrrrrible at plants/seasons/horticulture, I did not know that it was basically the last day of blueberry season. We still managed to collect about 10 cups of blueberries, which was plenty for my evil plans to make jam. The power was off-and-on most of the weekend, but by Sunday I was confident that nature would no longer thwart my jammy endeavors, so I gathered my gear (which doubles as medieval torture devices, BONUS). 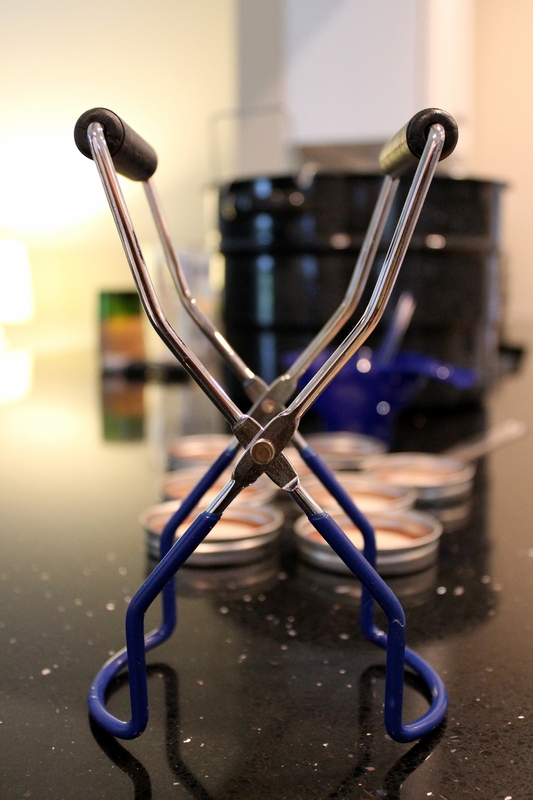 I bought a very basic canning set many years ago, and it has served me well. 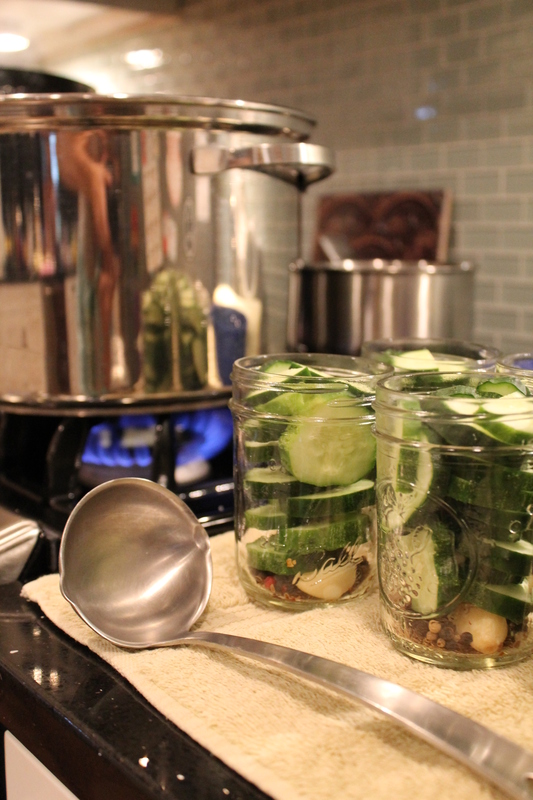 Canning is intimidating – so much boiling water! sterilization of jars and lids! molten fruits! – but once you get the hang of it, the process is pretty straightforward. First you cook your fruit into jam, then you process the jars so it’s shelf-stable. If you’re just starting out, I recommend the Ball Blue Book, which is like the Gospel of Preservation. Alternatively, you can just make friends with someone who cans stuff and offer to be their guinea pig. Voila. 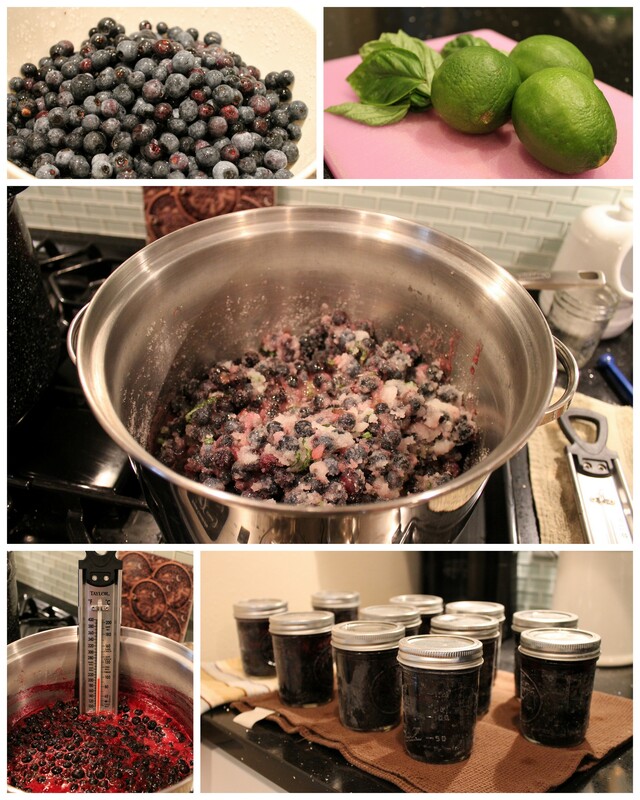 I decided to make a blueberry basil jam, based on this recipe from Cupcake Rehab. I used 10 cups of blueberries, 6 cups of sugar, 16 basil leaves, and the juice of 3 limes. This yielded 11 cups of jam. The jam is very tasty – it’s not too sweet, and the basil adds some flavor interest. Don’t get me wrong. These are all lovely. 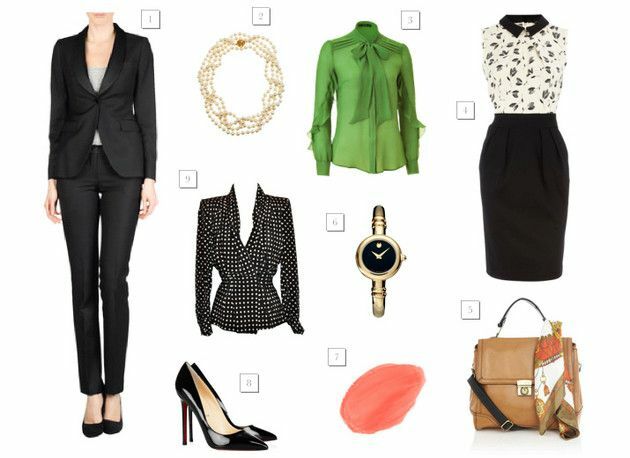 But not even the attorneys at my office dress this nicely. 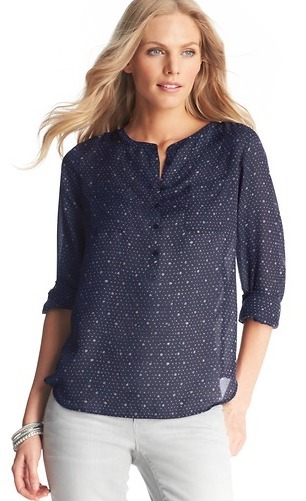 At the other end of the Pinterest clothing spectrum, it seems, are Outfits with Jeans – clothes that would be cute and appropriate for my office, were it not for our no-jeans policy. Amazing. It worked. I’m like some kind of magician. I looooove this necklace, which I rescued from Loft on sale. Wasn’t that generous of me?